Giving a “shout-out” to our favorite equipment and supply providers. Banner Greenhouses, located in Nebo, N.C., not far from Asheville, grows a multitude of bedding plants and flowers, but in the last decade they have been producing excellent organic vegetable seedlings. On our recent tour of their facility we saw how they are able to produce such excellent plants for farmers all over the region. We learned a good deal about their tomato grafting techniques, how to use companion plantings for pest management, the best ways to manage light and temperature in the greenhouses, and how to find and even apply recommended organic fertilizers for our own high tunnel crops. Banner’s produce seedlings are all certified organic, and are of the highest quality. We highly recommend Banner Greenhouses to our partner farmers, too, or any of our wholesale or specialty grocer clients who sell ornamentals – their bedding plants are exceptional. See an article on our visit and tour of the Banner Greenhouse facility here. 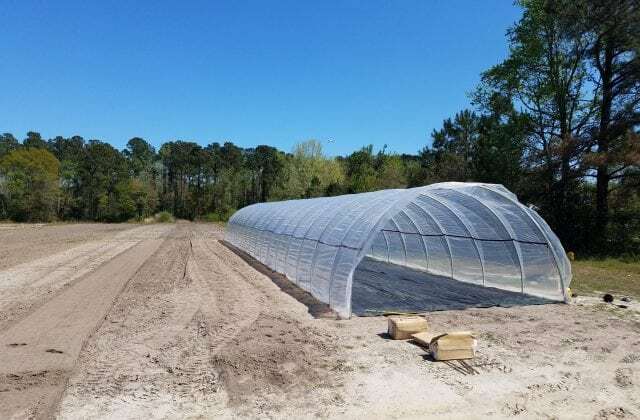 Our first Williamson Greenhouses caterpillar tunnel at the River Bluffs location of Turner Family Farms. Currently, Williamson Greenhouses doesn’t have a big presence online. They don’t need to because everybody in the region knows who they are. They are located here in Clinton, N.C. The owner, Michael Johnson, is an expert greenhouse designer and builder, and is generous with his time. We have called him many times over the years with advice on greenhouse construction and fixes. In the Spring of 2018, Turner Family Farms partnered with Michael in designing a move-able caterpillar tunnel. At 19′ wide and over 10′ tall in the center, it’s big enough for us to use our powerful but small Deere 955 compact tractor on the inside. The distance between bows is such that the tractor can drive between the bows if necessary. We are able to get 5 – 100′ beds inside. The tunnel comes with a central mister system and an optional shade cloth for hot weather. It’s amazingly strong even though the plastic is only held on by overlapping ropes. We have one of these caterpillar tunnels at this time, but we have plans to erect as many as eighteen in the next three years. Farmer’s Friend is located in Williamsport, Tennessee. We buy from them online. We first became aware of them when a few of the progenitors of the sustainable produce farming movement, such as Eliot Coleman and J.M. Fortier, began raving about the Farmer’s Friend Quick-Cut Greens Harvester. This tool saves man-hours ten fold when it comes to harvesting salad greens, baby winter greens, and even micro-greens with the optional bench attachment. We currently use the Harvester, their amazing Pyroweeder, and their heavy-duty silage tarps. For more information and pictures, check out our blogpost here. Berry Hill Irrigation , located in Clarksville, Virginia, is an indispensable supplier of equipment and supplies for Turner Family Farms. Frankly, we couldn’t do without this place. We have bought everything from our bedders, to irrigation supplies, to landscape fabric and bedder plastic, and, while they are located in Virginia, their ability to pack and ship items to us is seemingly supernatural. For more on that story, read our blogpost here.